The Hofner Shorty Electric Guitar, perfect for the travelling musician! 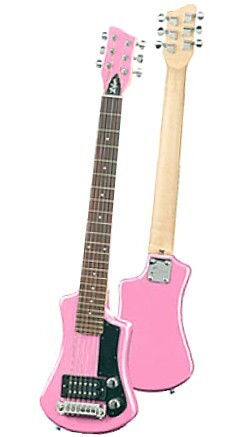 Here is the Hofner Slimline Shorty Travel Electric Guitar, available in pink. The Shorty model was made popular in the Eighties and has made a revival! This is the ideal travel guitar, which has the benefit of a small body but still comes equipped with a full size neck and 24-3/4 inch scale length. Thanks to the humbucker it still packs a punch! The Shorty has a great sound, with good playability and is easily tuned. The guitar comes with a fitted, padded gig bag. There is now no need to leave your electric guitar at home when you go travelling! Overall length 82cm / 32 1/2"